Perhaps you’ve heard the news about the forthcoming closure of the Divine, the “Modern Greek” restaurant at 80th and Roosevelt: it’s closing after service tonight. News of Divine’s closure was a blow to Eater Debbie Jeske, who sent an e-mail elegy this week, noting, “There’s no restaurant we’ve visited so often (25 times in the three years we’ve known about it) or loved so much.” Part of the draw, she said, was owner Vivian Peterson, “a great personality” who opened Divine in 2006 following its tenure as Calypso Caribbean Kitchen. It’s lights-out after dinner tonight at Divine, holding down the corner here at 7919 Roosevelt Way N.E. When I spoke with Vivian Wednesday night, she admitted things have been slow, and with the help of her cook (and a friend who’d lend a hand when things got busy) she’s essentially been running the show alone — a tiring task when you’ve got a 7-year-old. Yet she insists “I’m not going out of business” at Divine, and instead has chosen to close “for the greater good of my success.” Someday, perhaps as soon as next year, Viv said, she hopes to recreate Divine elsewhere, in an area with a greater concentration of dining places. Till then, she expects to take some time to find her focus and intends to seek out “other opportunities” that excite her: like teaching cooking classes, as she did during the Bite of Seattle, where she took to “The Bite Cooks!” demonstration stage to show the crowd how to make one of Divine’s house specialties, pastichio. 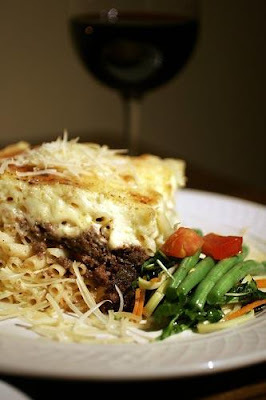 Vivian’s family recipe for pastichio (aka Greek lasagna) was a house specialty at Divine. Tying together her talents as a cook, illustrator and avid gardener, Vivian envisions a cookbook in her future — as well as some R&R while doing R&D in Greece. Gazing into her crystal ball, she also has visions of inking herself a Food Network deal, she said. Meanwhile, she’s not quite inked the deal on the sale of her restaurant. “I have a potential buyer,” she told me, and in keeping with the neighborhood’s casual call, that buyer has plans to put a pub in Divine’s place. Let the sauce simmer for 10-15 minutes. Turn off and stir until slightly cooled. Stir in egg whites. (Save the yolks for the bechamel). You do not want the sauce so hot that it cooks the egg whites immediately. They should be incorporated. Melt butter in heavy saucepan. Add the flour and whisk for about one minute. Add the milk (warmed through first in a pan or microwave) all at once and whisk until sauce is thickened and smooth. Add a healthy dose of salt, pepper and nutmeg to taste. Remove from heat and stir in eggs and cheese. Bring water to a boil with salt. Cook noodles until tender but slightly firm, drain very well and return to pan. Stir in butter. Preheat oven to 350 degrees. Butter a large, deep pan (lasagna pan works well). Place half the noodles in the pan and sprinkle with 1/2 cup of cheese. Top the noodles with the meat sauce. Place the remaining noodles on the meat sauce. Pour the bechamel over the top. Sprinkle on the remaining 1/2 cup cheese. Some of the noodles will be sticking through the top, which is good because they get brown and crunchy in the oven. Bake for approximately one hour or until top is lightly browned. Remove from the oven and let sit at least 15 minutes before cutting and serving.